Any Ecuador explorer however would be remiss in skipping over Quito. 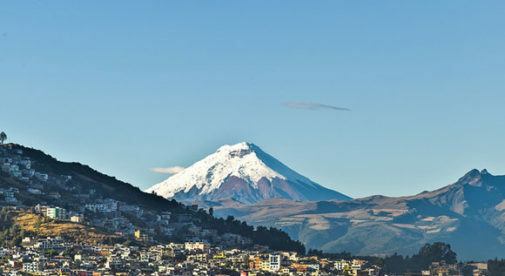 Aside from all that a city of 2.5 million people has to offer, there are many fabulous day trips that can be experienced right in or near Quito herself. Here are three of the best. “Qui” in the native Kichwa language means half while “to” means earth. Even the ancient pre-Colombian civilizations recognized that Quito sits on the equator and today you can visit the official monument and museum dedicated to 0 degrees latitude. It is known as El Mitad del Mundo. At the nearby Intiñan Museum you can explore Ecuadorian culture and lifestyles, learn about the equator, and partake in interactive demonstrations for a $4 entry fee. Once there you’ll be introduced to equatorial oddities in the form of water swirling in opposite directions on either side of the equator, balancing an egg on a nail head, and loss of balance and strength while on the equator. It’s up to you to decide if these demonstrations are legit or not, but it’s a fun time no matter what. A taxi can take you to El Mitad del Mundo for around $20 or hop on one of the public city buses for $.75 per person. At the site itself you can look around on your own or pay for a guided tour. You’ll have the option of buying a basic ticket for $3 allowing access to the monument or buy a full ticket for $7.50 which gives you the option to wander the small village of shops and restaurants, informational centers, and planetarium. London is not the only or even the best city in which to ride a red double-decker bus. Quito has its own version of two-story people mover and it is one of the best ways to explore the city for the day. For $15 ($7.50 for children and adults over 65) you can enjoy a tour through the most interesting parts of Quito. You’ll pass by many of the city’s best features including the Basílica del Voto Nacional with its dizzying towers, the beautiful Plaza San Francisco, and the renowned statue of the Virgin of Quito which looks down on the city from the Panecillo hillside. The entire tour takes three hours if you stay on the bus, but you are allowed to hop off and hop on anywhere along the route. For anyone interested in seeing the high points of Quito from a comfortable venue, this bus tour is the way to go. You can ride right by the sights that are of marginal interest to you, yet disembark to explore in depth any area you would like. And for those concerned about the language barrier, rest assured that the audio commentary on the bus is offered in both Spanish and English. If you’re looking for a relaxing way to spend the day, consider heading over to Papallacta Hot Springs, just 40 miles east of the city. Arguably the nation’s best thermal springs, Papallacta sits just over the crest of the Andes making for cool and misty high-altitude weather. The climate coupled with the surrounding tundra-like páramo and distant snow-sprinkled mountains make the hot waters all that much more inviting. At Papallacta you’ll find several complexes of hot pools, but the best is the privately run Termas Papallacta. There are a variety of pools of different sizes and temperatures which means it won’t be hard to find the perfect relaxation point for everyone. The daily price for use of just the pools is $8.50 per adult or $22 if you’d like to use the spa. The town of Papallacta is also known for its hiking trails and stunning views on clear days. If you’re the active and adventurous type you might consider arriving in town early. This will give you time to do a bit of trekking, enjoy a delicious lunch of trout at one of the local diners, and then rest your weary muscles in the hot mineral waters. Getting to Papallacta from Quito is easy. The most cost effective method of transportation is through the public bus system. From Quito’s Quitumbe bus station you can buy a ticket for under $5 on any bus headed to the Oriente (Coca and Tena are the two most popular towns there). Just tell the bus attendant you’d like to depart at Papallacta and they will let you know when it’s time to get off.